John Smoltz is a pitcher who I have long had mixed emotions about. On the one hand, John Smoltz is a likely Hall Of Famer who has had tremendous success throughout his career. On the other hand, John Smoltz has had a series of serious shoulder and elbow problems that have limited him at various points in his career. Let me explain what I see in John Smoltz's arm action, why I believe it is the root cause of his elbow and shoulder problems, and why I think his career may be over. I first came across the term Inverted W on Paul Nyman's Setpro.com web site. Nyman used the term "Inverted W" to describe John Smoltz's arm action. While I think the Inverted W is a (mostly) accurate description of John Smoltz's arm action, unlike Paul I think it is an example of what not to do rather than what to do. I say that because I think the success of pitchers like Greg Maddux, Tom Glavine, Nolan Ryan, and Roger Clemens -- none of whom make the Inverted W -- tells me that the Inverted W is not necessary to throwing either hard or well. 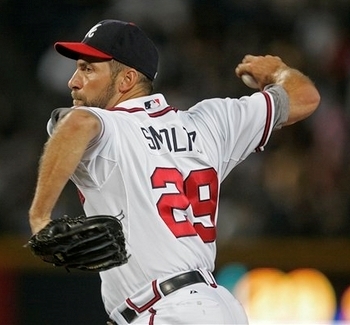 John Smoltz is an example of a pitcher who breaks his hands with his elbows (and who lets his elbow pick up the ball). After breaking his hands, John Smoltz leads his arm swing with his Pitching Arm Side (PAS) elbow so that his elbow quickly gets above the level of his PAS forearm and hand. John Smoltz then continues to lift his elbows as he scap loads. As a result, at the moment John Smoltz's Glove Side (GS) foot plants, his shoulders start to rotate, and his PAS upper arm starts to externally rotate, John Smoltz's PAS elbow is still quite high and, more importantly, his PAS forearm is not yet vertical and in the high-cocked position. This increases the load on both his elbow and his shoulder (and in particular his Labrum) by increasing the distance over which, and the force with which, his PAS upper arm will externally rotate. As I have said elsewhere, the Inverted W and the Inverted L are not (that) bad in and of themselves. Rather, they are problematic because they can create a timing problem (akin to rushing) which can increase the load on a pitcher's elbow and the shoulder. If you look at slow motion video of John Smoltz, from various points in his career, you can see both his Inverted W and the timing problem that results. I believe the clip above of John Smoltz is from relatively early in his career. The thing to notice is how John Smoltz comes to the Inverted L position in Frame 80. This creates a timing problem by increasing the time it takes for his arm to get to the high-cocked position. As a result, in Frame 89, when John Smoltz's GS foot has planted and his shoulders have started to rotate, his PAS forearm is only passing through the horizontal. I believe the clip above of John Smoltz is from the last few years. Notice how in Frame 33 you can see that John Smoltz starts to lead his arm swing with his PAS elbow. Watch how high his PAS elbow gets. In Frame 35, John Smoltz's PAS elbow has reached its maximum height. John Smoltz's PAS elbow doesn't get as high as the PAS elbow of Mark Prior, which is why I would rate John Smoltz's arm action as borderline and why John Smoltz hasn't experienced as many problems as Mark Prior has. However, you can see that making the Inverted W hurts John Smoltz's timing. Notice that his PAS forearm isn't vertical in Frame 36 at the moment that John Smoltz's GS foot plants and his shoulders start to rotate. The clip above of John Smoltz is from Spring 2008. 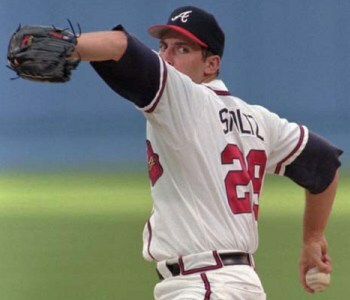 The thing to notice is how John Smoltz's arm action has changed since early on in his career. The Inverted L is gone and the Inverted W, while present, is less apparent. Instead, John Smoltz is exhibiting more of a Horizontal W in this clip, which is good and is what you see in the arm action of Nolan Ryan. Notice how, while John Smoltz still leads with his PAS elbow out of his hand break in Frame 32, his PAS elbow is much lower in Frame 34, which is the point of its maximum height. His timing problem is still present in Frame 37, but is less prominent. His PAS forearm is closer to vertical at the moment his GS foot plants and his shoulders start to rotate. 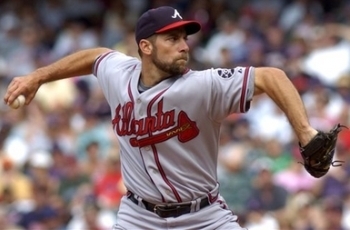 The bottom line about John Smoltz is that he has always had a problematic arm action, and poor timing as a result. This has increased the load on his elbow and shoulder and has led to problems with both of them. Labrum problems are a typical result of timing problems and, because they can be so hard to fix completely, I wouldn't be surprised if John Smoltz's career is over.